A personal loan is a type of unsecured loan that can be used to fund just about anything that you need, whether it is to buy a new phone or for home repairs, etc. Many people choose personal loans when they are in immediate need of funds. Job continuity proof: Current job appointment letter or employment certificate ? Personal loans are available in many different kinds, based on their purpose. Listed below are some of the most common personal loans you can find today. Festivals are of immense importance in India, and celebrating them with pomp and enthusiasm, indirectly translates to expenses. A festival loan is a short-term loan that banks offer so that you can meet these expenses. Since most festive expenses aren’t exorbitant, the borrowing limit on this kind loan is relatively low. At the same time, they also have a low-interest rate. Renovating your home is not something you do every day, which is why it is best to make all the changes you want at one time. A home renovation loan allows you to do this without exhausting your savings. Another benefit of this loan is that the interest you pay on it will be exempted from tax for up to Rs 30,000. As the name suggests, a fixed rate loan is a loan where the rate of interest doesn’t change during the period of your loan. The benefit of this loan is that you, as a borrower, can predict your future payments. This loan eliminates the risk of having to deal with higher interest rates as the loan period progresses. Every day newer and better technology is emerging in the market. Are you someone who loves to stay updated with the latest trends of consumer durables such as electronic gadgets and home appliances? If yes, then you need not worry about funding. Consumer durable loans are specifically designed to fulfil these needs. Most people want a lavish wedding, but not all can afford it. A wedding loan is an ideal way to take care of some or most of your wedding requirements, including expenses like shopping for sarees or jewellery, decoration etc. Many people opt for these loans as it allows them to meet expenses with little worry. Not sure you if you want to spend all of your savings on the next family trip? With a holiday loan, you can keep your savings intact while enjoying a vacation! This type of loan usually has higher interest rates compared to other loans but is a good idea when you know a big payout is coming to you and you need time to arrange it. The total loan amount you can be eligible for depends on your holiday location and credit history. Please Note: This may vary from one bank to another. Since a personal loan is unsecured - i.e. you don’t have to maintain a collateral - such types of business loans are quite a good deal. This kind of a loan is particularly useful if you want to expand a business. Also, if you wish to start your own business, you can apply for a business start-up loan to meet your financial needs. Here, your loan amount is based on your credit history and eligibility. 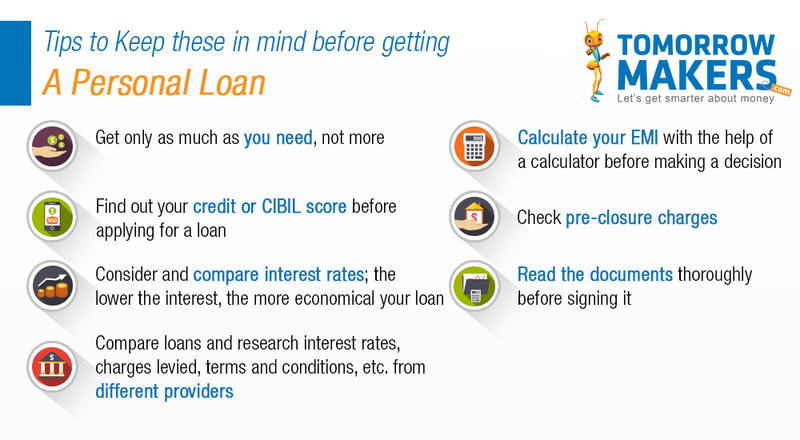 Understanding the different loans available to you can ensure you get a loan that perfectly suits your needs. This way you don't end up spending more or getting a lower amount etc.